You’ve got your recording finished and realized there’s a hum or hiss on one half of the recording. This quick tutorial will walk you how to import your audio into Audacity, split the stereo track and remove the noise. Start by downloading Audacity from audacityteam.org/download for your operating system (Mac, Linux or Windows). In this case we have an mp3 that was recorded from Skype via Piezo from Rogue Amoeba. It records your mic on one channel, and the Skype caller on the other channel. When we start, we have a single stereo track. You can see in the silence sections on the second track that the center line is thick – that should be a thin line, instead it’s actually noise. We want to remove that noise but only affect the second track. Tap on the disclosure triangle next to the track name and select Split Stereo Track. This does not exist as an option in the menus up above, only under this disclosure triangle. Now that we have two mono tracks, select the track with the noise. Hopefully you have a good sample area, but Audacity can do amazing things even if only with a few seconds of data. You can see in the bottom track a grey area that I’ve selected as our noise profile. When you click this, the window will go away and it won’t look like Audacity did anything at all, but in fact you’ve just told it, “this is what noise looks like”. Select entire track, or all of the area where the noise is you want to remove. You should see a yelow border around the track if you’ve selected it properly. Now that you’ve taught Audacity what noise looks like, you can do Step 2 which is telling it to actually remove the noise. The tricky maneuver here is to simply push OK. If you want to go wild and play with the controls, have fun, or just click OK like I do. Now you can see that in the same gap (and elsewhere) the line is thin, indicating visually that the noise is gone. If you find the audio is distorted as a result of the noise removal, you might want to go back and mess around with those controls. Well I am trying but my audio is so much mixed with the outside noise that I am not able to separate it out. Can you provide some help for such audio file? That’s the hardest thing, Nitin. If you don’t have a segment where you can sample just the noise, the only thing you can do is sample where there’s noise and real audio you want. The result will probably be awful. I wish I had a better answer for you. The lesson forward is to figure out how to eliminate the noise before recording. Also always do a test recording. Even with the technique I demonstrate, it will still sound sub-optimal, just not as bad. I have a video file (mp4) for which noise needs to be removed. Could you please help ? Kumar – you’ll need to use some kind of video editor to extract the audio from the video. High end apps like ScreenFlow and Final Cut Pro X can extract the audio but if you have QuickTime, you can open it there and choose File, Export, Audio Only. From there you can open the audio in Audacity to remove the noise. But then you’ll need a video editor to get the audio back into the video, right? I don’t know of free options to do that. If you had Final Cut Pro X, you could remove the noise while in the app, not needing Audacity at all. there may be free video editors out there that can do this but I’m not just familiar with the topic well enough to advise. Is it possible to remove, if not, almost remove the instrumental to a song? I’m using Noise Reduction and it’s not doing anything to my track. Christina – no, it’s not possible to remove an instrumental track from a song if all you have is a mono track. With the little information you’ve provided about using noise reduction I can’t possibly help you figure this out. Please describe exactly what you’re doing in detail and I might be able to help. I’ve seen it do bad things to a track but never nothing. This is fantastic! I’m trying to make high-quality videos and the noise from my computer fan was adding some really unprofessional sounding noise. The other day I was going nuts trying to learn what settings to change on my microphone and wondering if I needed to buy a software program. This did a great job of getting rid of that noise and I already had it on my PC. Thanks very much for this! Glad this helped, Janet! I have to say, after you go through this one time, you learn to find ways to stop the noise in the first place. I used to have lots of fan noise from a laptop and I just started keeping it on a cooling gel pack so it wouldn’t fire up the fans so badly. As it aged I had to use icepacks wrapped in towels. Finally I cleaned out the vents and the fans went back to normal. All way easier than removing noise after the fact. This was really easy to follow and works great – at least it would have done if my emergency phone video wasn’t so bad to be beyond repair. Will definitely be remembering this for future audio though. We have a pesky neighbor that lets her dogs bark continuously and we’re getting recordings of it for a court thing but in the background you can hear her talk and say stuff about us. However, we have a lot of white noise(static) that I’m trying to remove so we can hear what she’s saying. I’ve tried numerous things but it ends up getting distorted. I’ve read that a lot of people use the noise removal tool but I only have noise reduction. I’ve checked the add-ons tool bar and everything is enabled. I don’t have a noise removal tool. Any help would be greatly appreciated. Thanks. Travis- The only thing I know that can help is to teach Audacity what the noise sounds like by giving it a good sample of only that noise. Do you have a reasonable length of pure noise? Under the best of circumstances, you always get some distortion. I don’t know much about rules of evidence but it’s possible processing this audio might make it problematic to use. After I did the noise reduction the track is so quiet I had to turn my speakers all the way up and I still could barely hear it. Is there another step I’m missing? I have done exactly as told but with noise reduction but nothing happened, rather the vocal voice has reduced. When I select OK to reduce the noise, my sound waves for the entire recording disappear. I can still play the recording back, but I am unable to do any editing because I cannot see the sound waves. Stumped Newbie. I tried this out a few times, and the audio kept coming out a bit “Tinny” after reduction. What should I do? I’m afraid with noise removal, tinny is the usual side effect. You can back off on the settings but you’ll always be trading off noise for tinny. Best solution overall (for the future) is to ensure you don’t have noise going into the recording in the first place. I’ve imported my track, but it won’t let me “Split Stereo Track”. There’s only one track that shows up when I import my track. Not 2. So this doesn’t work from the beginning for me. Help if you can. Thank you. Hey Joshua – it’s kind of hard to tell what’s going wrong without seeing your file. Thank you so much. I did a simple podcast this evening, and I was trying to clean up my audio for background noise. I used your easy step by step method and wow, all done in few seconds. Actually, you brought smile on my face because you are good teacher – one who can make things easy for non-experts. I have shared the URL with you where I posted the podcast in my website, it is about guided meditation, anyways. Thank you again for your help! You made my day, Deb! I love to do these tutorials and if it only helps one person it gives me motivation to keep doing them. Smiling right now. So I wonder if the people having trouble isolating a section of the track to ‘create a noise profile’ are attempting to do so while viewing their entire recording. Go to the ‘view’ button, ‘zoom in’, multiple times and you can easily find a “noise only” sample. Also I ‘noise removal’ and ‘noise reduction’ are the ~= same thing. Great point, John. I haven’t actually looked at the instructions for years since I originally wrote this. I just reread and I see that I did show selecting a small area, but you make it much more obvious what people should be doing. I’m afraid that if the segment is too short, it may not be able to get enough information to do a good job of reducing noise. Hopefully, your advice will help others. I must thank you because you made it so simple that’s the key, and the mark of a good teacher (I have said that before as well). Well, I just wanted to update you, because it might be helpful for people who are on tight budget like me doing pod-casting and visiting your site. The podcast is there now, sorry it took a little while to upload it to Libsyn (URL is on my previous comment). I used a cheap $20 tie-clip microphone, my Samsung S7 as the recorder, and Audacity. Off course your valuable tips to clean it up. I think the recording is of decent quality (bearing in mind I have a 6 year old, and we all know what 6 year old’s do). Thank you again, I do appreciate your work, and I will keep following you. Thank you so much, Deb – big smiles on my face! I don’t see your URL though, I wonder if my spam watching stuff stripped it out of your post? I’d like to hear how it sounds. From reading you I’m guessing that your passion for your topic will make podcasting a real joy for you. When you’re ready to step up your game on microphones, I have some recommendations for some inexpensive options. Thank-you, good morning from beautiful Canada. But, I can see the URL and it is working in my first comment though. If you click on my name it is there. Please delete this comment if necessary, it might unnecessarily spam your comments section. I wish you had nested comments. Well, yes I would love and appreciate your comments on Microphones. But, I do have a high quality Rode NT-1 but that needs setting up etc. (time-consuming). But with my phone, it is so much easier just plug in and record, and you can do it anywhere, so I was experimenting with things and also it is a cheap set-up. Would love your comments on the audio please or suggestions when you have time? Your audio sounds fantastic! I can’t believe that’s from a cheap lavalier mic on your phone. Thank you Allison, for checking it out. Well, it is surprising where we are going in terms of technology, moreover I did not not clean up everything, BTW I am an IT professional (Database – nothing to do with audio engineering), and my boss, Rob is a big fan of mobile technology, and Google platform etc., actually he got me into it, and I decided why not give it a try, now you’re such an experienced professional Allison, you feel it is good enough, so I feel it is worth it!! Take care. What do the numbers under “Noise Removal” do and what would adjusting them do? tried it and it made the tape hiss worse as well as the audio quality. That’s a shame. If you don’t have a spot where there’s just the hiss, it’s hard for Audacity to figure out what is hiss and what is good audio to keep. The best thing to do is eliminate hiss and noise at the source _before_ recording. I suggest finding a way to monitor the recording as its being made so if noise starts coming in, you can stop and fix it. I ALWAYS do a test recording and listen to it before doing my final recordings. Even if I’ve recorded a few minutes earlier with the same setup, I check it again. It’s amazing how it changes when you’d swear you’d changed nothing. followed your advice but I think i’m stuck with what i have. Trying to remove a gear sound from my camera when zooming in and out while recording video (with audio), want the camera gears out, but trying to keep the rest of the audio. Is this possible? Steve – because you can repeatedly make that sound happen with your camera, you might have a good chance. Try recording just the sound of the camera gears for a few seconds with no other audio over it. Add that to the audio clip you’re working with. Then use the raw gear noise as the sample, and then apply to the real audio. Does that make sense? Let me know if it works! I have a recording from an experimental setup from which i tent to eliminate noise. I also have recorded noise separately can i use this recording of noise to eliminate it from my experimental recording.These recordings have been done using a microphone so noise is from sources like tubelight. I finally understood, thanks for that. I have a recording with music in the background and cant hear much other than the music. How do i eliminate the music? I’m afraid this isn’t possible, with any software. Trying this, the help in Audacity was not as helpful as this. I have a problem. I’ve selected the noise part of the track, but when I click effects I am not able to select Noise reduction or any effect. Can’t understand what I am doing wrong. You have mentioned that “We want to remove that noise but only affect the second track.” Why don’t we remove the noise from the first track also as it also has noise lines? Why is it showing 2 tracks for a single audio file? You have mentioned to select the track with the noise, in my case both one’s are having noise. If I select the either one a yellow border forms outside that recording. I am not able to select them both at the same time. How to do that? How to save the file in mp3 format itself, as the output files are getting saved in .audacity format only. bond007 – Good questions. In my example, I used a stereo recording where there was noise on one person’s mic, but not on the other. This happens with Skype calls sometimes where one person doesn’t have good noise isolation. One stereo track has a left and a right channel, hence the two waveforms. I showed that so I could demonstrate how to split the two sides. Applying noise reduction causes audio artifacts, so if one side didn’t have noise, it would be better to leave it alone. I’m glad you sent a screenshot of your recording to illustrate what you’re dealing with. Sadly it looks to me like you have a VERY low signal to noise ratio. It looks like this may have been recorded using an audio jack instead of a USB-mic. The audio jacks on computers don’t have enough gain to provide a clean signal. You may get usable audio using the techniques I describe above but I’m not terribly hopeful with the audio file you have. If this is a precious recording to you it’s worth pursuing but if not it would be better to rerecord with some better equipment. In answer to your last questions, it looks to me like this is a stereo recording of a single source, like one microphone. In that case, you can separate them as I describe above and then delete the second track. One mic can’t produce stereo sound so it’s just useless to you. To save as other than .audacity, choose File/Export and choose the format you desire. If you want to export to mp3, you’ll have to install the LAME encoder. I don’t have the bandwidth to walk you through this, but the steps to do this are in the documentation and help files. http://www.audacityteam.org. Good luck! Everything is very open and very clear explanation step by step for audacity, thank you for sharing with us, keep moving. Do you really have to split it into individual stereo tracks and process them separately? You really do, AJ. In my experience the noise is usually on one track (like one side of a Skype call) so you really don’t want to apply noise reduction to a track that doesn’t need it. Thanks a lot for replying. All queries solved, just one major remaining. Yes the audio is being recorded from an Old Galaxy smartphone. When I split the track both mono tracks have the same graphical noises or bars. I selected them both using ctrl+a and followed the rest of the steps but the end track was just like the original. I selected one track and then followed the rest of the steps but the result unfortunately was the same. Any help? Maybe because I have an old version of Audacity, but when I try noise removal I get less noise–but I also get a burbling kind of sound that’s just as annoying as the noise. Any ways to avoid this problem? Thanks a ton! This really helped me out and the audio sounds so much more professional even though I am using all cheap equipment. if I send you my flash drive, can some one do it for me ? I know nothing is free……………. @zin. Yes i can help. Send me your email. Hey folks I’ve used this before and it’s great makes cheap audio sound pro. Small issue is I made a work video today and there’s cars going by in the background, can this same technique be used to get rid of that? I guess rather than select little bits/hissing and what to cut out, is there a way to select just what you want to keep? What if your split audio tracks are exactly the same? Hello everyone. I just recorded a podcast using Audacity. During the playback, you can hear a cyclical swishing noise. Any thoughts about how to get rid of that? Do you have any silence where you can capture the noise to remove it? And as always the best way to get rid of noise is to figure out where it’s coming from before you do a once in a lifetime recording. Isolating the mic from desktop vibrations, turning off AC/Heat, etc. I monitor the audio (including my own voice which is ANNOYING) so when there’s noise I know about it immediately. The main reason I suggest splitting the tracks is if you have a true stereo recording with one person on one track and the other on a second track. Splitting will isolate the side where the noise was created and not affect the other track. If when you split the track they’re the same, just delete one of them and do your noise reduction on the maintained track. Does that make sense? I have a recording of a phone conversation while in the car. Is it possible to remove all of the road noise from the recording to be able to hear the other person (on the other end of the call) on the phone conversation as well? I’ve done that, but I still can’t hear the other person on the line. I tried to amplify the conversation but that did not work. Any suggestions would be appreciated. I misunderstood your problem, Leslie. If the audio from the other person isn’t there, there isn’t a program in the world that can create it. what levels should i set the noise removal step 2 at? Matt. it all depends on how bad the noise is. I start with the defaults and if the resulting audio is too distorted, I undo and dial it down and try again. Perhaps someone else understands the controls better than me and can provide a more detailed answer. Hello, I have an audio recording from a phone, however the contain include the conversation but also music, dogs barking, car and motocycles passing by, an electricale appliances kick starting every few minutes. i would like to know how to get a clear copy of the conversation with all the unwanted noise remove. Its very urgent and i thank you in advance. That is going to be nearly impossible, I’m afraid. The noise removal tools require a consistent noise, like a hum or a hiss. Random noises like motorcyles and dogs are not possible to remove in any sort of automated way. If this is really crucial you might be able to have a professional audio editor work on it (and it will cost you a lot). I’m not even sure it’s possible. i have been manipulating the audacity for a few days. I have manage to clear some noise however while manipulating the audio with various set up, i have notice that there are two kind of blue area, a light blue and slightly darker blue. Is there a possibility that I can erase one of the blue area. It just for a few minutes of the audio. I am convinced that i require only of blue area out of both and the audio will be perfect. Hey, Could Someone help me remove some noise from a Wedding Clip Ceremony? Super Buzzy! I can email you the track today! Thanks guys. I am trying to transfer an older audio recording from a cassette. It is only a speaking voice but the whole time talking there is an overwhelming noise. Not sure if its the age of the tape or need to apply this method. Does anyone have suggestions? Or another tutorial? LuAnn – have you tried the technique in the tutorial? You didn’t say so it’s hard to advise. THANK YOU!!! My boss is having me transcribe some terrible quality audio and this helps a lot! I wanted to clean up some old tapes of my father in law singing traditional Irish songs, this did the trick very well prior to adding vocal enhancement, thanks very much for the advice. That’s such a cool project, Rory. I’m so glad this helped you, I’m sure those are treasured recordings. Cant seem to get rid of white noise, any suggestions? Yes, have tried the tutorial and cannot select a section of the noise because its the whole way through so the program doesn’t even give me a chance to do noise removal, not highlighted to select. Both tracks are identical; I see no difference as is portrayed in the directions for noise removal. Also, my Audacity offers “noise reduction” and not removal. I tried the process suggested, repeating it three times, and still I have a LOT of hiss (computer fan noise). Any other suggestions? i have recorded a program audio in laptop with using mixture, but entire audio clip was too buzzy! i have tried with this software tool , but the result was not satisfactory. Could anyone suggest me how to do? or lemme know some other software tool..! I am trying to remove background music from song but not yet done ,, could you please any one help me. Allison – thank you for taking the time to create this tutorial. I followed the steps and it worked perfectly. Contributions such as yours is what makes the internet great and I commend you for it. 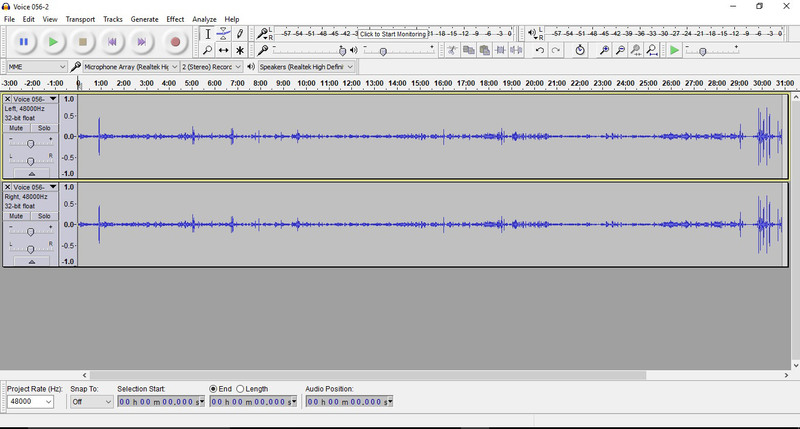 As has been commented by other users above, the menu item within Audacity has changed (at least on Windows) to Effect > Noise Reduction (instead of Noise Removal). Please verify its the same on other operating systems and then update the article for the benefit of other people. Thank you so much! I can’t always depend on the quality of my live radio show, but I don’t want to leave anything out when posting replays. Thanks to your tutorial, I don’t have to! Thanks! Audionamix makes something called IDC (Instant Dialogue Cleaner) that can help with denoising your audio. I’m not sure that it can work with Audacity. They also make software that can take music out, etc. Thanks so much, this helps a lot! I don’t duplicate the tracks. I split the tracks so I can work only on the track with the noise. Does that make more sense? You may have only one track so can skip that step. Great Work bro! It worked like charm. God Bless You. One more thing, A video on how to take care of the cracked voice as people with not-so-good-quality microphones face, would be really appreciated. ” Audavity did not recognize the typr of file xxxxxx.mp3. If it is uncompressed, try importing it using “”Import Raw”.” and if I import as raw the file it plays only for a second with a continues bip sound whereas the file play in VLS and other player also of sixe above 1MB. Pls help. Great tutorial, this article solved my noise reduction issue, thanks for sharing. Excellent Guide to remove noise. Thank you so much for sharing this useful guide with us. So glad this helped, David; you made my day! I have several audio recordings for different car exhausts and some of them have either wind noise or hissing that makes the recording unusable. I try to make these exhaust sounds as realistic as possible and I know the key is in Audacity just don’t know exactly how to use it. I select a part of the audio with no sound at all and make the noise profile but when I apply this in the recording, nothing seems to change.